Straight Talk: Narcissism and Sociopathic Behavior: Are You Ego-Driven or Self-Driven, and Are You Awake? 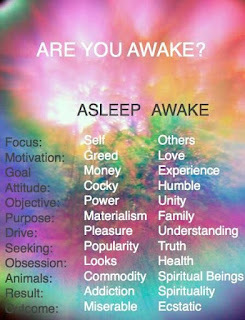 Are You Ego-Driven or Self-Driven, and Are You Awake? Have you ever tried to discover what truly drives you? What inner force is it that pushes me through each day, creating actions and solving problems? It can often be difficult to determine the source of this power we hold, but cannot deny its existence! So if we know it is there, why is it so difficult to identify clearly? It begins with quieting both the mind and the body so that we can get to the actual source of who we are. The world is chaotic and distracting, and will offer everything it can to keep you from finding yourself. If we are always looking out, then we never get to see what is inside. Our external senses have been offered every pleasure we can imagine now that the internet is fully grown, so why would we bother looking at those dark places within ourselves? The ego-driven leaders at the top know this as well as I do, but also know how to use that to their advantage as predators. They will continue to fill your senses with anything that can be marketed to you. Although many of the current theories about awakening and enlightenment could hold some truth, there is still a personal agenda of someone trying to capitalize off of your current confusion. They will make you feel part of the group again! You can be a 'lightworker' or an 'empath' or an 'indigo child', just come be part of our club! Sorry, a little sarcasm there. I will continue to tell you to look within for the answers, and will do my best to offer information which will help you to do so. I don't have the answers you seek, I only have experience and wisdom to share. So back to my original point about what drives us as human beings. Well, currently the majority of the world is Ego-driven, and that is due to mass human dysfunction. The Ego was well programmed for survival and modest socialization, but the world's progress is out of control and our egos have not quite caught up yet. This is human evolution happening right in front of us! Our degree of consciousness must increase in order for our species to survive, and although there is much suffering involved, I am delighted to be here in the world at this time to observe it. in the fact that you have kept your ego in check, but unfortunately it took a lot of suffering to do so. Here is the good news! Your suffering was not for nothing! It means that you are more self-driven than ego-driven. It also means that you have a degree of control over your ego already and have evolved. You will continue to evolve and likely have more suffering yet, but you are most definitely on the right path if you can answer this next question properly; Do you exist for personal gain or personal growth? If you instantly said personal growth, then you are going the right way, and I say good for you! It has not been an easy path to follow yet you remained true to it. No matter what your personal belief system is, when our body dies on Earth, which is inevitable, what do you have left? If you have spent your life seeking personal gain then all you have left is stuff, and I certainly would not want to be in that position on judgment day. If you have spent your whole life growing as a good human being, you are faced with a much more welcoming thought. Some believe that we blink from existence when we depart Earth, but the rest of the world believes that we go somewhere. I will not try to define what that somewhere is, that is the job of religion. I can only tell you this, wherever the next existence is, you will certainly want to be carrying a huge bag of personal growth with you because your money and stuff will be no good there! For those of you who chose to suffer through personal growth during this existence, your time is now! The world needs good and kind-hearted empathetic beings more than any other time in our recorded past. If you have been filling up your bag of personal growth items, let me tell you, you are already ahead of most of the people on the planet right now and can start breathing a little more easily. There is no fear when you are on the right path! Find peace and self for now, and look within to your driving force and ask it for all the answers you are looking for. If you are ego-driven, I will suggest that you learn self reflection soon, because your awakening is coming as well. Treat others well because they may be the one you need to turn to for guidance in the near future. "The meek shall inherit the Earth". Treat the meek well! p.s. For those who are currently awakening, treating others kindly is a virtue that does not change through this process. The most ego-driven and evil people on the planet will eventually need your help to get through this, treat them kindly as well!